The Bollegraaf HBC 120 S single-ram horizontal baler. Today's horizontal, single-ram balers are highly automated, high-tech machines, using automatic bale tying, SMART technology, and monitoring systems with remote diagnostic capabilities. They provide easy maintenance, low-downtime, easy changes between materials and are highly productive, while being more environmentally friendly than ever. Bollegraaf has been building single-ram balers in Europe since the 1960s. 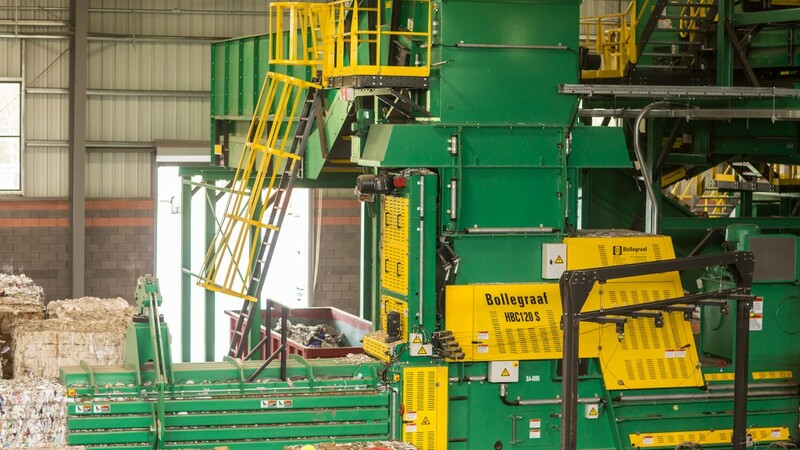 The company's single-ram balers were first introduced to the North American market in 1984 by the founders of Van Dyk Recycling Solutions, which today, remains Bollegraaf's North American distributor. "At that time, single-rams were primarily used as paper balers in the dual-stream recycling environment," says John Reuckert, senior technician at Van Dyk Recycling Solutions. "By the mid-to-late-1990s, single-stream recycling emerged, and Bollegraaf's baler evolved to bale containers in addition to fibre. "One of the biggest advantages of a Bollegraaf baler is its ability to process a variety of materials quickly," says Rueckert. He adds that advanced autonomous operation allows "intelligent" setup and feeding of different materials with just a few touches on the operator touchscreen or remote tablet. On the latest models, production throughput has significantly increased, providing immediate time and labour savings. "Since the beginning Van Dyk and Bollegraaf have strived for constant improvement, all while remembering our ‘legacy' balers," says Reuckert. "In the last 10 years, we have introduced a variety of improvements, many that can be retrofitted to earlier models." He says recent advances include: autonomous operation, whereby the baler "learns" material, equating to up to a 20 percent increase in production and container weights; intuitive operator panels that are as easy to operate as a smartphone; simplified needle and knotting systems, providing lower part count, higher throughput and better reliability; and available double-channel cylinders, for higher bale densities and more consistent bale size and shape. When comparing single-ram balers to two-ram balers, Rueckert says that single-ram balers have always excelled in fibre production facilities. "Rather than tearing apart and mashing material into a wall (basically what a two-ram baler does) the single-ram baler uses the previous bale to help retain and compress material." He says this provides efficiency, more consistent bale weights, faster grade changes and no "orphan" bales when two grades are introduced to a bale chamber during grade changes. "Current advancements in autonomous operation, double-wire capability, automated perforating systems, tying systems and pressure adjustments have turned Bollegraaf machines into the perfect vehicle for baling heavy loads of both containers and fibre at impressive speeds." Bollegraaf HBC-120S - The latest innovative upgrades that have been incorporated in the Bollegraaf HBC-120S single-ram horizontal baler include a hydraulic lift for needles, Hardox wear-resistant steel plates, double channel pressure, double wires, and a self-learning/adaptive channel pressure control (a self-regulating control that adapts to the material being baled in the channel and can increase the bale weight by 10-20 percent). The single-needle system leaves less room for residue to accumulate during the knotting process, reducing downtime. With evenly distributed material, the Bollegraaf baler is designed to produce stable bales and has a reduced risk of wire breakage. Whether using steel wire, PP or PET wire, these balers are highly suitable to bale even the most difficult waste streams. A key option available on the HBC-120S, according to Van Dyk Recycling Solutions, the North American distributor of Bollegraaf balers, is a PrePress Flap, which the company says allows operation at very high throughputs by pressing a charge of material, while subsequently preparing the next full charge. This can reduce a facility's electric bill by up to 50 percent, reduce maintenance and labour costs, and allows baling of tough materials, including catalogues, roll stock, SBS and Gaylord boxes. It also helps operators make perfectly square and dense bales with even distribution, and which stack well. The 8043HSL-11225 is the next generation of American Baler's most popular single-ram recycling baler. American Baler Company made their first horizontal baler for the paper industry in 1945. "Single-ram balers are most productive in paper because the ram is pretty much always in compaction mode," says Mike Schwinn, American Baler's sales manager. "Bale weights can be 2,000-3,000 pounds, with very fast tie cycles compared to a two-ram. "As the packaging industry grew, so did American Baler Company as we developed machines to make heavier bales, automatic-tie balers, and larger recycling balers that can be used for a variety of materials besides paper," Schwinn continues. By adding additional retainers, for material springing back into the bale chamber, as well as other methods to increase friction, he says it can be key for baling materials such as heavy plastic. For textiles, he adds, they provide a full package that minimizes damage to product while baling. "But for some grades of plastic containers and non-ferrous metals - the quality of the bales and weights produced by single-rams will lead users back to two-rams," says Schwinn. "Also safety is a big consideration," he adds. "Category-3 balers with trap key systems and better guarding are increasingly in demand to improve the safety of baler operators. "The tension system design on single-ram balers is typically most critical," he continues. "American Baler Company uses a single-cylinder 4-way free-floating bale chamber tension control system that yields the heaviest bales, even when processing ‘harder' bale products that are slick, or with lots of memory." According to American Baler, the 8043 model (above) has proven itself as a workhorse in hundreds of recycling centres around the world. "We have combined the quickness of our 10-inch compaction system with the force of a 12-inch cylinder - also combining a new 225 hp unit," explains Schwinn. The 8043-11225 single-ram baler features a large feed opening (80 x 43 inches, up to 80 x 70 inches) and up to 30 tons per hour capacity processing OCC. Other key features include: export bale capability, laser ram positioning, a cylinder drive inserter system and Category-3 safety. According to Marc Massé, R&D engineer at Machinex, there are a few key options recyclers should think about when considering adding or updating their single-ram balers, including the use of a pre-press and shear combination. "Pre-compaction with pre-press technology increases the volumetric efficiency of the baler," says Massé. "This is especially true when baling fluffy material or material with flow characteristics, such as plastics that haven't been pre-conditioned. The addition of a shear blade eliminates potential jams when baling large products like commercial cardboard. Also, the pre-press will reduce wear on the knives and shear blade." When it comes to the hydraulic system, Massé says a pre-fill valve increases the main ram cycle speed in both forward and reverse modes. "The ram can obtain a speed up to 2.5 times higher than that of a traditional regenerative circuit for the same flow at the pumps, reducing the cycle time and increasing energy efficiency," continues Massé who adds that there is also a choice to make between horizontal and vertical tie styles. "While the vertical tie has a reduced footprint, the horizontal tying mechanism is easier to maintain, and horizontally tied bales can be easier to manipulate for forklift operators. Certain tying mechanisms also can result in lower wear and greater tying success." Machinex designs and manufactures single-ram high-capacity balers with processing capability up to approximately 85 tons of material per hour, specifically to help streamline MRF and other recycling operations. Machinex single-ram MLP Series balers are available in a range of sizes and capacities, and are engineered to provide easy and accessible maintenance, reduced bale handling costs, optimal baling density, and energy efficiency. Options include an exclusive pre-fill valve, as well as patented pre-press and shear technology. The pre-fill valve (part of the hydraulics system) provides a faster dry-cycle time that exceeds up to 2.7 times the speed obtained by other balers available on the market, and results in a significant reduction in energy consumption, according to Machinex. By adding pre-press and shear technology, the company adds that operators can significantly reduce their downtime and increase efficiency. Harris IPS Conquest II single-ram baler. In 1988, Harris acquired Selco, a single-ram baler manufacturer, and has built many single-ram balers over the years since, mostly for fibre recycling applications. "Harris builds single-ram balers for light applications, up to one of the largest and most productive single-rams in the industry," says Forrest Wildes, Harris's director of strategic accounts. The Harris IPS Conquest model has a huge 72-inch by 72-inch feed opening that can handle bulky OCC with ease, and because of articulating sidewalls, it also handles most high-grade paper without shredding or fluffing. Wildes says most single-ram balers have a feed opening of only 40 inches wide, therefore requiring the feed conveyor to input from the side, or 90 degrees from the bale exit. He adds that one of the biggest advantages of the single-ram is its ability to make an oversize bale. "If you feed too much material for the desired bale length, the baler simply makes a longer bale. The same is true when changing grades. You simply tie the bale at any desired length and change to another material. "The single-ram baler will process UBC, paper and plastic, as long as the plastic PET is perforated and run at lower pressure and bale length," he continues, adding that for materials like non-ferrous with not much memory, the single-ram is not recommended. "The biggest innovation for IPS-Harris has been the articulating sidewall," continues Wildes. "The sidewall opens up so you can feed large OCC in the feed chamber without bridging in the feed hopper. It also rolls high-grade material, so the baler does not require a shredder or fluffer. "I think in the future more applications will require smaller areas for recycling equipment, meaning that single-ram balers may have to be built to a smaller footprint. I also believe the future will require faster and heavier bales to meet shipping requirements." Harris IPS Conquest II - Designed specifically to process high-grade paper, OCC, ONP and newspaper with high efficiency, Harris IPS Conquest high-performance balers are engineered to dramatically increase production while virtually eliminating bridging problems. The Conquest's innovative design eliminates preconditioning, with no fluffer required to bale high grades. These machines will bale up to 45 tph of OCC, and up to 60-90 tph of ONP, providing consistent bale integrity, which assures maximum export weights. Harris horizontal balers are designed for ease-of-use with intuitive, programmable touchscreen displays, a self-aligning tension system, and built-in diagnostics. These machines provide maximum density and volume with programmable controls, 15 material selections, and are standard with a Category-3 safety system that continuously checks the status and function of safety interlocks and emergency stop devices. The Kadant PAAL KONTI automatic channel baler. Kadant PAAL, in a distribution partnership with Bulk Handling Systems (BHS), is currently marketing the company's proven European-built channel balers in North America. According to Jason Greatorex, Kadant PAAL's general manager for North America, in the single-ram baler market the majority of balers are of "channel-type" design. The exceptions include semi-automatic balers used in low-volume single-stream applications, which rely on the machine operator to manually tie off the processed bale. He says the most significant innovations in the Kadant PAAL range of channel balers over the last decade have been towards efficiency and reliability. "With energy costs continually increasing we have developed several changes, including high-efficiency axial piston pumps, which use less electricity but increase throughput; a new shear blade cutting design to shear more effectively and reduce stresses on the hydraulic system; and smarter electronics and hydraulics to produce denser, more uniform bales." Greatorex says these innovations, along with ease of access for maintenance and servicing result in less downtime of their balers along with increased productivity. "The Kadant PAAL range of balers can also now be specified with remote diagnostic capabilities, requiring just an Ethernet connection," he says. "This allows PAAL to ‘dial in' and monitor the machine's performance and if required, alter machine settings." He adds that Kadant PAAL balers can be ordered with other communication devices that interface with a MRF control system (such as Profinet). For data collection and manipulation, their balers can also send performance data to a computer showing the number of bales produced by material, total number of bales made, and provide a range of other operating parameters. Recyclers also need to consider the range and complexity of their input material when choosing a single-ram style baler for their operations. "With a channel baler, changing of materials is a very easy process," says Greatorex. "A bale can be tied off anytime in the production process when that material has finished. Then a recipe change (selected by a dropdown menu) alters the parameters of the machine, making it ready for the new material to be baled. This process stops cross-contamination of bales and allows information about the bale ejected at the end of the process to be stored and re-processed when baling the same material next time." He adds that if one compares channel balers to two-ram balers, the former provide vastly increased production capability, flexibility in materials being processed and ease when changing materials. "With channel balers, there are no mixed contaminants in bales when changing grades," he says. "They have a smaller footprint and cheaper consumables with less usage." He adds that there is also no downtime of the baler if there is a tying issue because channel balers have four or five wire-tie systems. "If there is a problem with one of the ties, the machine can still operate with the others, without having a detrimental effect on the form and shape of the bale," continues Greatorex. "Whereas with two-ram balers, when the tying system is inoperable, the machine and system is stopped. "I think the next innovation to come in the baler industry will be smart parts and ordering systems, in which wear parts, when worn, will notify the customer and baler manufacturer that they need to be replaced," he says. "Along with smart service notifications, where the machine notifies users it needs a service, this equates to increased reliability and baler performance. It allows proactive maintenance and minimized downtime by resolving potential issues before they arise. This will significantly reduce non-profitable man-hours and paperwork." Kadant PAAL KONTI automatic channel balers are manufactured in Europe and available in North America through Bulk Handling Systems (BHS). The Konti channel baler delivers high throughput and bale weights with low energy consumption. These machines are fully automatic, providing a combination of extreme pressing forces, high production rates and independence from the complexity of pre-pressing systems. The PAAL Konti range is offered with either vertical- tie or horizontal-tie, or with a cross-tie option for more difficult material. Units can also be supplied with pre-baling options such as a ruffle or perforator to maximize performance with particular material types.